With 2001’s The Lord of the Rings: The Fellowship of the Ring, Peter Jackson proved that someone could make a “sword and sorcery” style fantasy flick which would move a lot of movie tickets. With the 2002 four-disc release of that film, he and the others involved established a new benchmark for depth and quality in the world of DVD. The “Extended Edition” set for the second part of the Rings saga, 2002’s The Two Towers, does nothing as revolutionary in either way. It comes as something of a surprise that Towers actually outgrossed Fellowship by $26 million; I guess the home video release of the latter created enough new fans to more fully support the theatrical take of the former. Nonetheless, the financial success of Towers was virtually inevitable. As was the high quality of this five-disc Towers. It follows the benchmark set by its predecessor and establishes itself as another simply outstanding package. I’ll discuss the supplements in the appropriate area of this review, but here I’ll chat a little about the movie itself. For full coverage of my thoughts about Towers, please check out my review of the theatrical version. For this article, I’ll stick mostly with the differences evident in the extended cut of the film. Already a long movie, the “extended edition” adds 44 minutes to the flick. Towers now runs about 223 minutes versus the original’s 179 minutes. Actually, the entire program lasts 235 minutes, but the final 11 and a half minutes display “Special thanks to the charter members of the LOTR official fan club”. 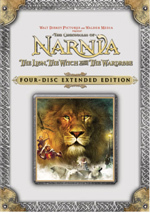 While the original Blu-ray packed the entire feature onto one disc, the extended version spreads the film across two platters. The first one runs 1:46:39 and cuts at a fairly natural point with the capture of Frodo and Sam. The second disc offers programming that lasts 2:08:51 if we include the lengthy fan club credits. In a nice touch, when you start Disc Two, it offers a menu that lets you either go right back into the movie or allows you to choose one of the four audio commentaries. Some may see this as a distraction since the film doesn’t simply continue without input from the viewer, but given the myriad of auditory choices, I like the fact the disc’s producers don’t just assume what version you’ll prefer. As for the actual film footage, this material integrates quite well into the action. I recognized some of the added scenes but not all of them; after two prior screenings, I guess I didn’t know the flick well enough to immediately detect every change. Many of the extended sequences seemed pretty modest in nature. Rather than add a few long bits, this version of Towers mostly featured a lot of smaller extensions. I liked that approach, for it supplemented the original film but didn’t alter its flow. According to the set’s booklet, the movie included 15 new scenes and 19 extended sequences. To my eyes, the most substantial change occurred in regard to the development of Faramir. We get a new flashback that includes his father and his brother Boromir. These give us a much better feel for his motivation in his desire to nab the ring. We also discover better exposition for the Ents. These characters make much more sense in the expanded version of the movie and come across as a more fully developed species. This also meant the Merry and Pippin played a more significant role in the extended edition, since so many of their scenes come along with TreeBeard and the Ents. Otherwise, the extra footage mostly fleshed out elements in a gentle way. We get information like Aragorn’s age and generally find small moments that give general exposition. The longer version of the film seems more readily comprehendible and provides a clearer telling of the tale. I viewed the new material as icing on the cake. The film works well in its theatrical cut, but these extended pieces make it just a little bit more satisfying. One nice touch: if you check out the chapter menus on Discs One and Two, you’ll find notations that indicate which ones include either new or extended scenes. This provides a helpful notation for those of us who feel less than secure in our knowledge of the material. This information also appears in the package’s booklet. The Lord of the Rings: The Two Towers appears in an aspect ratio of approximately 2.40:1 on these Blu-ray Discs. I’ve never seen a home video presentation of Towers I didn’t love, and this Blu-ray continued that grand tradition. At all times, sharpness excelled. The image boasted stunning definition, as even the tiniest elements came across as tight and well-defined. Not a glimpse of softness marred the presentation. I saw no issues connected to jagged edges or shimmering, and I also detected no signs of edge enhancement. Print flaws failed to do anything to disturb the beauty, as the movie was clean and clear. The dark atmosphere of Towers meant its hues were subdued. The first flick featured some settings with warm tones such as the shire or the elf lands, but Towers seemed much cooler overall. Even the greenery of the Ent locales looked a bit pale. I didn’t regard this as a problem, though, since the disc clearly replicated the movie’s intended palette. The colors were appropriately vivid when necessary and seemed accurately depicted. Black levels also came across well. Dark shots demonstrated good depth and clarity. Low-light shots were nicely displayed and seemed clear and adequately visible. Shadow was clean and tight. Given the darkness of so much of the film, those components became especially important, so their high quality was an important factor in the success of the transfer. Overall, the image of The Two Towers appeared immaculate. Though it didn’t quite merit the highest honors, I also felt very pleased with the DTS-HD MA 6.1 soundtrack of The Two Towers. The soundfield appeared very active and involving. All five channels presented lots of material that kept the viewer at the center of a realistic and immersive world. Elements seemed appropriately placed and they blended together well. Flying creatures soared from location to location accurately, and other pieces popped up in their proper places too. The whole thing meshed together quite nicely, and the piece worked swimmingly. Not surprisingly, battle sequences were the most impressive, but the entire package seemed strong. Audio quality equaled the positive nature of the soundfield. Speech was natural and distinctive, and I detected no issues connected to intelligibility or edginess. Music sounded bright and vibrant, as the score presented rich and full tones. Effects came across as accurate and concise. No problems with distortion appeared, and these elements were clean and broad. Bass response seemed excellent. I found much to like in the terrific soundtrack of The Two Towers. How did the picture and sound of this version compare to the original DVD from 2003? As great as that release was, the Blu-ray offered improvements. These were less substantial in terms of audio, but the lossless DTS-HD mix seemed a bit bolder and smoother. More obvious improvements related to the picture quality. Although I thought the DVD was great for its format, it can’t compare to the brilliance of the Blu-ray. Essentially both provide flawless visuals for their formats. Since Blu-ray’s potential best is much better than DVD’s top, that made this version of Towers superior. Numerous hours of extras accompany this five-disc release of The Two Towers. On the first two discs, we locate a whopping four audio commentaries. Called The Director and Writers, the first logically comes from director/co-writer/producer Peter Jackson, co-writer/producer Fran Walsh, and co-writer Philippa Boyens, all of whom sat together for this running, screen-specific affair. And a good one it is, as the participants offer a light and lively discussion of the film. They cover a terrific variety of topics. We learn about the additions made for the extended edition of the film as well as working with the cast, changes from the Tolkien book, effects, location and set challenges, plus many other areas. Jackson dominates but both women offer some good notes as well, and they cumulatively prove to be very chatty. The women even occasionally gang up on Jackson to make fun of him, such as when he facetiously discusses doing more reshoots to make an even longer version of Rings. Jackson also tosses out other funny remarks like his ideas for spin-off TV shows. Despite the very long running time of the feature, almost no empty spots appear during this entertaining and compelling piece. They offer a strong discussion in this concise and involving commentary – it’s the best of the set’s four. Next we find a Design Team track that includes remarks from production designer Grant Major, Weta Workshop creative supervisor Richard Taylor, conceptual designer/set decorator Alan Lee, conceptual designer John Howe, supervising art director/set decorator Dan Hennah, art department manager Chris Hennah, and Weta Workshop manager Tania Rodger. Though some of the participants seemed to sit solo for the track, most appeared to be clustered into logical groups. If you listen to this track, you’ll learn about all things visual in regard to Towers. The program covers props, sets, costumes, makeup and pretty much everything else under that falls under that umbrella. We find out about design and execution of these elements. Though this might seem dry, the commentary actually comes across as nicely lively and engaging. The pace moves quickly and provides lots of cool details about the material, with many fun anecdotes along the way. I liked the fact it offered so many notes about the visual design rather than simply “nuts and bolts” issues. For example, we learn about the stylistic concerns related to the computer created characters but we don’t hear about the technical areas; that’ll follow in the next commentary. Many tracks of this sort can drag due to excessive jargon and procedural matters, but this one goes by briskly since it avoids those traps. It offers a great look at the ways the crew brought Middle-earth to life, and it manages to provide a fun and entertaining glimpse at the design issues. It’s my least favorite of the four, but that’s not really a negative since the other three are so good. “Design Team” remains informative and useful. For the third commentary, we find a discussion from the Production/Post-Production Team. This program includes remarks from producer Barrie Osborne, executive producer Mark Ordesky, director of photography Andrew Lesnie, editor Mike Horton, additional editor Jabez Olssen, co-producer Rick Porras, composer Howard Shore, visual effects supervisors Jim Rygiel and Joe Letteri, supervising sound editor Ethan Van der Ryn, supervising sound editor Mike Hopkins, Weta animation designer and supervisor Randy Cook, previsualization supervisor Christian Rivers, visual effects DP Brian Van’t Hul, and visual effects DP Alex Funke. Many of these folks obviously sat together, and it appeared they sometimes clustered in logical teams. The results then were edited together to make this track. For Fellowship, I thought the production/post-production commentary was the least interesting of the four, but here it arguably stands as the second best of the bunch. It covers a mix of issues not discussed elsewhere. We hear a little about lighting and other photographic issues, sound effects, computer and other visual material, the score, editorial decisions, and a few additional subjects. Lots of great anecdotes and notes from the set appear. As always, the pace remains brisk and lively, and the commentary includes virtually no dead space. Overall, this commentary adds a lot to one’s knowledge of Towers. 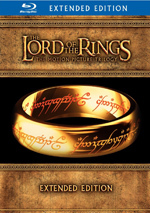 Lastly, we find a Cast commentary that provides material from actors Elijah Wood, Sean Astin, John Rhys-Davies, Billy Boyd, Dominic Monaghan, Orlando Bloom, Christopher Lee, Sean Bean, Bernard Hill, Miranda Otto, David Wenham, Brad Dourif, Karl Urban, John Noble, Craig Parker, and Andy Serkis. Logically, the trio of Wood, Astin and Serkis sat together, as did the pair of Boyd and Monaghan, but it appeared that the others were taped separately. Expect a lot of information from the actors’ point of view as well as many entertaining anecdotes here. Initially I felt disappointed that a few main performers Ian McKellen and Liv Tyler failed to reappear here, but to my surprise, this track seemed more useful than the equivalent for Fellowship. Both suffer from too much happy talk, as we hear an awful lot of praise splattered around during this discussion. Despite those elements, the track includes a great deal of interesting material. In addition to many notes from the set, we find a lot of intriguing character examinations. The piece offers a great take on the production as well as interpretation and other elements. It seems less rollicking than the Fellowship commentary, mostly because this one splits the hobbits. All four sat together for the 2001 flick, whereas the break up here. Monaghan and Boyd still give us most of this one’s funny moments, as they exhibit a nice chemistry together. Ultimately, the commentary proves to be informative and enjoyable. After all that we finally move to discs Three and Four, where boohoogles of additional extras reside. Disc Three starts with a 108-second Introduction from director Peter Jackson. He alludes to the difficulties encountered in making the flick. Jackson then gives us a quick overview of what to expect from these platters and also provides tips for navigation of them. Entitled “The Journey Continues”, Disc Three initially splits into six subdomains. J.R.R. Tolkien – Origins of Middle-earth offers a 29-minute and 29-second program that mixes short movie images, archival pieces, and interviews with Peter Jackson, co-writer Philippa Boyens, conceptual designer John Howe, The Lord of the Rings: The Making of the Movie Trilogy author Brian Sibley, Tolkien and CS Lewis author Colin Duriez, Tolkien’s publisher Rayner Unwin, JRR Tolkien: Author of the Century author Tom Shippey, The Visual Companions author Jude Fisher, Tolkien language translator David Salo, Defending Middle-earth: Tolkien, Myth and Modernity author Dr. Patrick Curry, and actors Christopher Lee, John Rhys-Davies, Dominic Monaghan, Sean Astin and Viggo Mortensen. This program covers Tolkien’s friendship with CS Lewis and its impact on his work, the effect of his World War I experiences on writing, the process of writing the story, the awkwardness of his story-telling methods, the decision to split the story into three volumes and their titles, some interpretation of characters and elements, and a number of other bits that affected the tale. Lots of good material about the genesis of Rings pops up here, and “Origins” provides an entertaining and highly informative glance at the subject. The 20-minute and 56-second From Book to Script: Finding the Story gives us some shots from the set, movie clips, and interviews with Peter Jackson, executive producer Mark Ordesky, co-writer Philippa Boyens, producer Barrie Osborne, co-producer Rick Porras, and actors Viggo Mortensen, David Wenham, Liv Tyler, and Elijah Wood. They go through the challenges involved in telling the second part of a trilogy and delve into many of the changes made from the original text. Of particular interest to fans will be the discussion of the unused thread of Arwen at Helm’s Deep; we see some shots from the set as the participants discuss what happened with that. Overall, “Story” gives us a solid examination of the adaptation process. Three smaller segments make up the content of Designing and Building Middle-earth. “Designing Middle-earth” lasts 45 minutes and 42 seconds and uses the standard format with movie clips, behind the scenes footage, and interviews. We hear from Peter Jackson, actors Ian McKellen, Sean Astin, Elijah Wood, Miranda Otto, Viggo Mortensen, Billy Boyd, and Bernard Hill, conceptual designers Alan Lee and John Howe, art department manager Chris Hennah, supervising art director/set decorator Dan Hennah, production designer Grant Major, director of photography Andrew Lesnie, visual effects art director Jeremy Bennett, producer Barrie Osborne, construction supervisor Ed Mulholland, co-producer Rick Porras, miniature builder Roger Lewis, greensmaster Brian Massey, senior matte painter Roger Kupelian, head of matte painting Max Dennison, location administrator Matt Cooper, carpenter Geoff Goss, and stunt performers Sala Baker and Mana Davis. This show covers many of the film’s visual elements. From early conceptual art to specifics of locations and sets and props, we get lots of information about these topics. After a general introduction and discussion of the ways the looks of Fellowship and Towers differ, we go through each of the movie’s sites in the order they appear. This becomes a satisfying way to explore the places and artifacts of the film, and “Designing” works nicely. It presents the material logically and with complexity, and we learn many cool tidbits, such as the problems with the construction of the gate to Helm’s Deep. Another documentary appears via “Weta Workshop”. It runs 43 minutes and 47 seconds and examines that studio’s work on Fellowship. The documentary lasts 43 minutes and features interviews with Jackson, Weta Workshop creative supervisor Richard Taylor, conceptual designers John Howe and Alan Lee, Weta designer/sculptors Jamie Beswarick, Warren Mahy, Shaun Bolton, Ben Wootten and Daniel Falconer, Weta Workshop manager Tania Rodger, Weta sword smith Peter Lyon, Weta Workshop supervisor Jason Docherty, Weta on-set coordinator Jamie Wilson, previsualization supervisor Christian Rivers, prosthetics supervisor Gino Acevedo, and actors Karl Urban, Bernard Hill, Jed Brophy, John Rhys-Davies, Dominic Monaghan, Billy Boyd, Orlando Bloom and Brad Dourif. “Workshop” looks at the design and construction of many Towers pieces and it also gets into the creatures, weapons, armor, and various other elements. “Workshop” features discussions of the building of the monsters, prosthetics, and additional practical pieces. At times we watch Richard Taylor as he walks through the different props and other things and tells us about them. This occurs less frequently here than during the companion piece on the Fellowship set, though. The emphasis remains on showing us the ins and outs of the various elements, and it tosses in more than a few fun anecdotes for good measure; the one in which Rhys-Davies plays a practical joke on Jackson stands out as a particularly good one. Overall, “Workshop” offers an entertaining and informative glance at the film’s many practical elements. This area concludes with two sets of “Design Galleries”. This area splits into two smaller domains: “The Peoples of Middle-earth” and “The Realms of Middle-earth”. “Peoples” further divides into “The Enemy”, “Gandalf the White”, “Rohan”, “Third Age Elven Warriors”, “TreeBeard”, “Ents”, “Faramir”, and “Ithlien Rangers”. Unsurprisingly, many of these then break down into character-specific galleries, and with so many of them at hand, I won’t list them all. Within the “Peoples” section, we find galleries for 21 different characters or types. Each of these includes between eight and 130 images for an amazing total of 999 stills. The shots show concept drawings as well as costume tests and other photos. In addition, 83 of the stills include optional commentary. An icon notes when this becomes available for certain shots, and we find statements from Christian Rivers, John Howe, Alan Lee, Paul Lasaine or Daniel Falconer. Their remarks provide some nice insight into the design of the various participants. The other section of the “Galleries” features “The Realms of Middle-earth”. This divides into 12 smaller domains: “Emyn Muil”, “Dead Marshes”, “Rohan”, “Fangorn Forest”, “Ithlien”, “Henneth Annun”, “Osgiliath”, and “Isengard”. These areas provide between nine and 115 stills for a total of 517 individual images. Like the “Peoples” domain, these mix photos and concept art. We also get 54 more commentaries for various shots. With the conclusion of all the galleries, we move to the Gollum domain. This launches with a documentary called “The Taming of Smeagol”. It fills 39 minutes and 33 seconds as we get the usual mix of elements and interviews. Here we hear from Rick Porras, Peter Jackson, Richard Taylor, Barrie Osborne, Ben Wootten, John Howe, Jamie Beswarick, Mark Ordesky, Weta senior animator Jason Schleifer, actor Andy Serkis, Christian Rivers, animation designer and supervisor Randy Cook, visual effects DP Brian Van’t Hul, Elijah Wood, Sean Astin, Weta creature facial lead Bay Raitt, Weta visual effects supervisor Joe Letteri, motion capture supervisor Remington Scott, visual effects supervisor Jim Rygiel, Weta systems architect Jon Labrie, visual effects producer Dean Wright, Philippa Boyens, Weta animation department head Adam Valdez, animation supervisor Richie Baneham, Warren Mahy, Weta 3D sequence lead Ken McGaugh, and Gino Acevedo. Possibly the most interesting of Disc Three’s documentaries, “Taming” gets into Gollum from start to finish. It begins with examinations of conceptual art related to the character as well as New Line’s doubts about the capabilities of the Weta digital artists and and then leads into Serkis’ casting in the role. We find out how his performance broadened the character and interacted with the others on the set and then discover how Serkis influenced the digital creation. We watch the animated Gollum come to life as well. A terrific amount of behind the scenes material fleshes out the subject and we really get a great understanding of the topic. A cool split-screen piece appears via “Andy Serkis Animation Reference”. On the top, this 106-second clip shows Serkis as he performs the confrontation between Smeagol and Gollum; the bottom offers the final film footage. We get a great look at how the animators used Serkis’ work as the guideline for their interpretation. For a humorous piece, we go to “Gollum’s ‘Stand-in’”. To set this up, we get a few remarks from Serkis, David Wenham, Elijah Wood, Sean Astin, producer Barrie Osborne, and co-producer Rick Porras. The three-minute and 19-second clip shows Porras in the “gimp suit” as he acts as Gollum stand-in for some second unit photography. It’s a fun bit. The final component of the “Gollum” domain presents another “Design Gallery”. This includes 95 images related to the character. We see concept sketches, maquettes, and other materials in this interesting little section. In addition, 23 of the elements provide commentaries; we hear from Mahy, Wootten, Falconer, Rivers, and Beswarick. With the Middle-earth Atlas, we can examine the “geographical context to the events that take place in The Two Towers”. It allows you to follow four different paths: Frodo and Sam, Merry and Pippin, Legolas, Aragorn and Gimli, or Gandalf. Essentially this means we wind out way through the map and see brief movie clips to illustrate each location. Frankly, the “Atlas” seems a bit lame. I’d prefer some greater depth of information about the different places instead of this abbreviated version of the film. For specific location information, we move to New Zealand as Middle-earth. It leads us through the sites for Emyn Muil, the Dead Marshes, Rohan, Edoras, Ithlien, Fangorn Forest, and Helm’s Deep. You can examine these individually or use the “Play All” to see them as one 14-minute and 26-second program. It includes remarks from Barrie Osborne, Rick Porras, Andrew Lesnie, Peter Jackson, Mark Ordesky, Bernard Hill and Dan Hennah plus lots of video footage from these places. We see Jackson and crew as they scout the spots. “New Zealand” offers a quick and efficient glimpse of these locations, and the original video shots of them offer interesting contrasts with their appearances in the flick. Disc Four receives the title “The Battle for Middle-earth Begins” and divides into six smaller sections after a 65-second Introduction from Elijah Wood; it serves the same purpose as Jackson’s opening on Disc Three. We begin with Filming The Two Towers, which then splits into three subdomains. “Warriors of the Third Age” runs 20 minutes and 57 seconds as it offers the standard combination of film snippets, behind the scenes footage, and interviews. We get remarks from Barrie Osborne, stunt coordinator George M. Ruge, Rick Porras, assistant swordmaster Kirk Maxwell, Sala Baker, Viggo Mortensen, cultural fighting styles Tony Woolf, mocap combat choreographer Carrie Thiel, Orlando Bloom, Peter Jackson, stunt performers Lani Jackson and Augie Davis, swordmaster Bob Anderson, actors Craig Parker and Sean Bean, Bernard Hill, Miranda Otto, Mana Davis, second unit director John Mahaffie, Richard Taylor, Elijah Wood and Billy Boyd. “Warriors” mainly concentrates on the fight choreography and the battle sequences. We see preparation for those scenes and training of actors and stunt people. Some good shots from the set appear along with a few fun anecdotes, but “Warriors” seems like one of the disc’s fluffier documentaries. While it includes a reasonable amount of useful material, it tosses in too much praise and happy talk. It still gives us nice information, but it feels less substantial than most of the other shows. Though its title implies a fairly technical program, “Cameras in Middle-earth” really offers more of a production journal. The 68-minute and eight-second documentary goes through different realms as it conveys general details about the shoot. In addition to the scads of on-set footage, we get comments from Barrie Osborne, unit production manager Zane Weiner, Elijah Wood, Viggo Mortensen, Dominic Monaghan, Andrew Lesnie, John Rhys-Davies, Peter Jackson, Sean Astin, Billy Boyd, Sala Baker, Karl Urban, Orlando Bloom, Mark Ordesky, Bernard Hill, Miranda Otto, Andy Serkis, Richard Taylor, Brad Dourif, Carrie Thiel, John Mahaffie, Jed Brophy, Sean Bean, David Wenham, Rick Porras, Craig Parker, Lani Jackson, George M. Ruge, Philippa Boyens, and physical effects supervisor Steve Ingram. “Cameras” remains mostly anecdotal in nature as it provides documentation of the shoot. We follow the production from location to location in the order they appear in the film. These elements show lots of behind the scenes material that aptly displays the various challenges and issues. The interviews tell us more nuances of the production and toss in some nice details such as various injuries, occasional tensions, and different challenges, boat training. “Cameras” remains engrossing and informative from start to finish. This area finishes with a collection of “Production Photos”. We get a total of 58 shots here. Two of them come with some comments from Gino Acevedo. It’s a decent but unspectacular set. When we move to the Visual Effects realm, we split into three subdomains. From there, “Miniatures” further divides into three smaller topics. “Big-atures” offers a 21-minute and 49-second documentary about the film’s small-scale sets and objects. It includes comments from Jackson, Richard Taylor, Alan Lee, John Howe, Rick Porras, Tania Rodger, Dan Hennah, Barrie Osborne, Philippa Boyens, Brian Massey, Brian Van’t Hul, Christian Rivers, Ed Mulholland, Steve Ingram, visual effects DP Alex Funke, armour weapons/standby John Harding, and Weta Workshop miniature builders Mary MacLachlan and John Baster. After a general discussion of miniatures, we get more specific information about the following topics: “Helm’s Deep”, “Barad-Dur”, “The Black Gate”, “Fangorn”, “Osgiliath”, “The Flooding of Isengard”. It shows these components in nice detail and allows us to gain insight into their creation. It’s especially terrific to take closer looks at the miniatures in closer detail. During the prior program, we saw snippets of “The Flooding of Isengard Animatic”. This component lets us watch the entire 90-second piece. You can check out the amusingly crude early take on its own or in a split-screen comparison with the final footage from the film. Also in the “Miniatures” section, we find a collection of seven “Galleries”. These cover “Barad-Dur” (54 stills), “Fangorn Forest” (eight), “Helm’s Deep” (27), “Ruined Isengard” (52), “Osgiliath” (22), “The Black Gate” (34) and “Zirakzigil” (nine). That’s a total of 206 shots, 48 of which come with commentary; we hear from Howe, Bennett, Lasaine, Funke and Alan Lee here. The galleries offer a mix of concept art and photos of different parts of the miniatures. These elements really allow you to appreciate all the detail work that went into their creation. For information about computer effects, check out “Weta Digital”. This 27-minute and 30-second piece offers statements from Peter Jackson, Barrie Osborne, Alan Lee, Orlando Bloom, John Howe, Joe Letteri, Jim Rygiel, Dean Wright, Roger Kupelian, Christian Rivers, Richie Baneham, Brian Van’t Hul, Randy Cook, Jon Labrie, Carrie Thiel, Weta visual effects producer Eileen Moran, Weta chief technology officer Scott Houston, Weta 3D sequence lead Gray Horsefield, Weta models supervisor Matt Aitken, software developer Steve Regelous, Massive crowd supervisor Jon Allitt, Weta 2D sequence lead Mark Lewis, Weta 3D sequence lead Wayne Stables, and IT manager Duncan Nimmo. This program covers most things computer animated, with a particular emphasis on digital sets and creatures. Some of the better moments relate the details about the warg battle, digital doubles, TreeBeard and the other Ents, and virtual armies. “Weta Digital” includes lots of nice information and is an enjoyable piece. Finally, “Abandoned Concepts” lets us look at two topics in gallery form. “Slime Balrog” presents 27 sketches of that sequence, while “Endless Stair” includes four drawings. Two commentaries – from Falconer and Rivers, respectively – shed some light on “Slime” and give us decent information about what that scene would have been. Editorial: Refining the Story gives us a 21-minute and 57-second featurette about this topic. We hear from Peter Jackson, Rick Porras, Elijah Wood, Barrie Osborne, Mark Ordesky, editor Mike Horton, additional editor Jabez Olssen, co-producer Jamie Selkirk, and supervising digital colorist Peter Doyle. They discuss the reasoning behind the use of a different editor for each of the three movies, the absence of a prologue, challenges presented by the film’s multiple story lines, the lack of public previews and the use of private ones, pickup shoots, keeping the battle of Helm’s Deep at a reasonable length, and other story-telling issues. The show includes coverage of many intriguing topics as it ably presents all of the concerns faced by the editorial staff. It gives us a good look at the assembly of the movie. Within Music and Sound, we locate three subdomains. “The Soundscapes of Middle-earth” lasts 21 minutes and 25 seconds as it presents remarks from Peter Jackson, Barrie Osborne, Rick Porras, Christopher Lee, Mike Horton, Mark Ordesky, supervising sound editor/co-designer Ethan Van der Ryn, supervising sound editor Mike Hopkins, ADR recordist Chris Ward, sound designer David Farmer, re-recording mixers Chris Boyes and Michael Semanick, foley artists Simon Hewit and Phil Heywood, sound effects editor Brent Burge, and foley engineer Martin Oswin. Among other parts, we learn of taping in a cemetery, recording crowd noise, creating Fangorn, altering Rhys-Davies’ voice for TreeBeard, mixing Saruman and Gandalf for one sequence, the warg attack and other creatures, various elements for the battle of Helm’s Deep, and some other pieces. The focus seems somewhat scattershot as it flies from one topic to another, but it remains consistently entertaining. The addition of shots of the various recording sessions and ideas adds to the documentary. I always find sound design fascinating, and this program offers a nice look at how they brought the audio of Middle-earth to life. Next we get a “Sound Demonstration” for the Helm’s Deep sequence. This 66-second clip lets you check out the scene from eight different auditory perspectives: On-Set Production Audio, Foley, Effects 1 (Weather, Torches, Horn), Effects 2 (Weapons, Ladder, Objects), Effects 3 (Marching, Hits, Falls), Dialogue and Vocal Effects, Music, and Final Mix. It’s a flexible and interesting way to break down the various elements. In a helpful touch, it replays ad infinitum so you can flip between tracks without fear of having to constantly restart the program. Unsurprisingly, ”Music for Middle-earth” concentrates of the film’s score. In this 25-minute and 19-second piece, we get comments from Peter Jackson, Barrie Osborne, Rick Porras, Philippa Boyens, David Salo, composer Howard Shore, executive music producer Paul Broucek, and score engineer John Kurlander. They go through various themes and elements of those such as choices for instrumentation. We also learn about different vocalists used in the film, the collaboration between Shore and Jackson, recording the music, Jackson’s cameo on the score, additional and altered music for the extended version of Towers, and some other elements. We even hear about their geeky need to recreate the cover of Abbey road. It’s a good look at the music and all its components, and the program provides a fun piece. Disc Four comes to a close with The Battle for Helm’s Deep is Over. This nine-minute and 27-second program offers a valedictory statement for the movie. We find statements from Peter Jackson, Barrie Osborne, Mark Ordesky, Elijah Wood, Viggo Mortensen, Dominic Monaghan, Karl Urban, Billy Boyd, Andy Serkis, Philippa Boyens, Richard Taylor, John Rhys-Davies, Sean Astin, and Rick Porras. Other than some shots of the various Towers premieres, “Over” offers little useful material, but it acts as a nice send-off for the package, especially since it concludes with a couple of minutes of credits for the folks who put together this amazing set. When we head to Disc Five, we get a Behind the Scenes documentary. Filmmaker Costa Botes made this one-hour, 46-minute and 16-second program. We find notes from director Peter Jackson, extras wrangler Josie Leckie, director of photography Andrew Lesnie, camera operator Richard Bluck, armour weapons standby John Harding, greens master Brian Massey, co-producer Rick Porras, designer/sculptor Daniel Falconer, senior machinist/engineer Dominic Taylor, animation supervisor Randall William Cook, stunt performer Steve Reinsfield, extras casting Miranda Rivers and Victoria Cole, painter Brett Larsen, carpenters Geoff Goss and Ross Hoby, supervising unit location manager Richard Sharkey, 2nd AD Marc Ashton, stunt performers Mana Davis and Sala Baker, 2nd unit director Geoff Murphy, boom operators Eoin Cox and Corrin Ellingford, on set art director Simon Bright, camera operator Peter McCaffrey, motion control operator Henk Prins, previsualisation supervisor Christian Rivers, digital surveyor Nick Booth, stable foreman Lee Somervell, gaffer David Brown, set finishing supervisor Kerry Dunn, on set art director Joe Bleakley, effects technician Peter Zivkovic, on set prosthetics makeup Tami Lane, 3rd AD Chris Husson, Weta Workshop’s Richard Taylor, effects technicians Darryl Richards and Scott Harens, stunt rigger Paul Shapcott, New Zealand stunt coordinator Kirk Maxwell, swordmaster Bob Anderson, medic and safety officer Andy Buckley, supervising art director Dan Hennah, conceptual artist Alan Lee, Gimli scale double Brett Beattie, and actors Dominic Monaghan, Billy Boyd, Andy Serkis, Bernard Hill, Brad Dourif, Elijah Wood, Orlando Bloom, Sean Astin, Miranda Otto, and Viggo Mortensen. The Two Towers doesn’t feel as engrossing as its predecessor, but that’s almost inevitable given its spot as the middle chapter of a trilogy. It’s still an excellent movie that continues the tale well. The Blu-ray adds 44 minutes of mostly useful and entertaining material that serves to make the film even stronger than its Oscar-nominated theatrical cut. The package displays absolutely stellar picture and audio as well as a nearly exhaustive roster of supplements. It’d be nice to get the movie’s theatrical cut as an option here, but even without it, I still adore this set. It’s as good as a Blu-ray release can get. 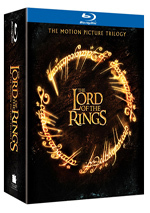 Note that as of June 2011, you can only purchase this version of Towers as part of a 15-disc “The Lord of the Rings Motion Picture Trilogy: Extended Edition” package. This includes all three movies with copious amounts of extras for a retail price of $119.98.